Secure your spot NOW for Haystack Connect! It’s only Two Months Away – Are You Ready? Sponsorships are going quickly and the exhibit hall is filling up. Build name recognition, reach new customers, sell your products and services, and connect with the Haystack Community. If you haven’t secured your company’s spot, don’t delay! The first round of agenda selections has been announced on the Haystack Connect website. The Call for Speakers is open for round two of submissions, but only a few spots remain. Submit your ideas for consideration by March 31. Haystack Connect provides a unique, open-forum for professionals involved in automation, control and the Internet of Things to learn and share the latest technologies and techniques for connecting systems and utilizing device data in applications including intelligent buildings, energy management, remote monitoring, and other IoT devices and applications. 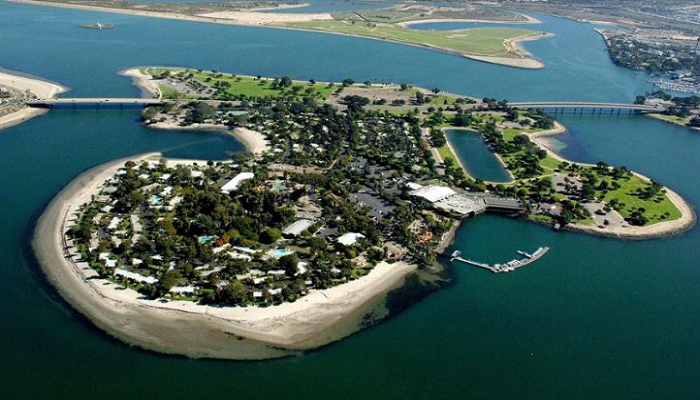 This year’s conference will take place May 13-15, 2019 at Paradise Point Resort and Spa in San Diego, California. 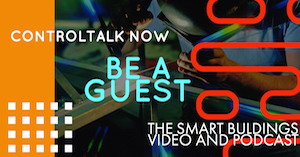 Episode 289: ControlTalk NOW — Smart Buildings Videocast and PodCast for week ending October 28, 2018 features our extensive video coverage of the 2018 Honeywell Momentum, held in Orlando, FL. Lots of great interviews with many of the contractors, distributors, and Honeywell executives in attendance. We are also joined this week by special guest Therese Sullivan, Director Channel Marketing at Tridium. Therese explains Edge 10 economics and applications. 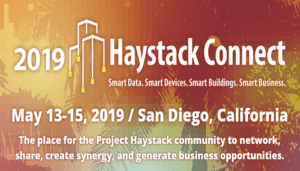 Project Haystack 2019 Conference dates are May 13-15, 2019 in San Diego, CA. More information to follow. And, Opertgy’s P864 Controller is now available for your next Smart Energy Monitoring and Control project. 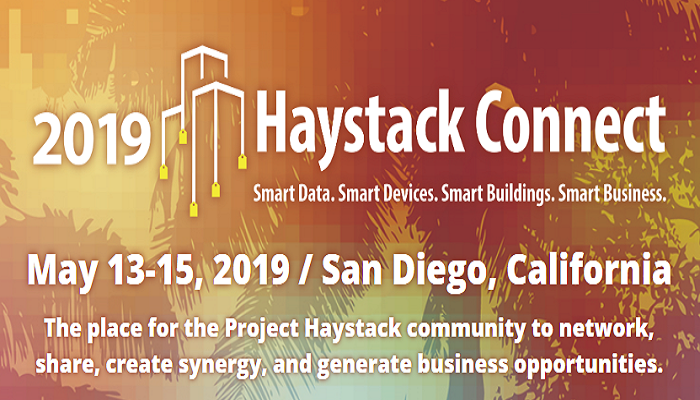 Haystack Connect 2019 will take place May 13-15, 2019 at Paradise Point Resort & Spa in San Diego, California. Haystack Connect provides a unique, open-forum for professionals involved in automation, control and the Internet of Things to learn and share the latest technologies and techniques for connecting systems and utilizing device data in applications including intelligent buildings, energy management, remote monitoring, and other IoT devices and applications. 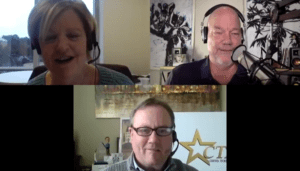 Our guest on this week’s CTN is Therese Sullivan, Director Channel Marketing at Tridium. Therese explains the Edge 10 ROI is there! And, it’s time to get data out of the historic, older, smaller, and more pedestrian buildings — that couldn’t justify a costly investment before, now — represent a great opportunity. The Edge 10 is a perfect fit for these buildings and with additional features like Niagara’s Bulk Deploy, it’s even easier than ever. Honeywell Momentum 2018 Day 1 Opens with Innovation Evangelist Terry Jones: “Disruption and Innovation are Two Sides of the Same Coin.” Some 400 of Honeywell’s top distributors, integrators, and contractors joined together inside the Crystal Ballroom of the Renaissance Orlando at SeaWorld®. Expectations were high. Keynote speaker Terry Jones, Mike Keller, Honeywell’s North America Buildings Sales Director, and Michael Garceau, Honeywell’s new General Manager, quickly met and exceeded all expectations. 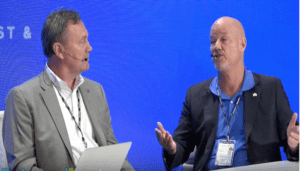 Honeywell Momentum 2018 “You’ve Got Connections” Day 2 Features Cybersecurity Expert — Kevin Smith, Tridium’s CTO & Chief Architect.Honeywell Momentum 2018 Day 2 featured Cybersecurity Expert — Kevin Smith, Tridium’s CTO & Chief Architect. Breakouts continued throughout the day, with sessions including: IP Controller Programming, Niagara 4 Security Updates, Sales Acceleration, and Analytics on the Edge. The evening ended with a Gala Celebration and the 2018 Honeywell Momentum Awards Dinner, which recognized Honeywell’s top Distributor and Contractor Performers. 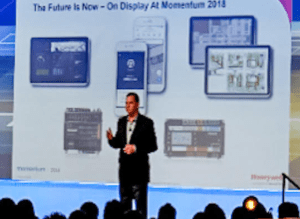 2018 Honeywell Momentum Executive Summaries from Mike Keller and Michael Garceau. Mike Keller, Honeywell’s North America Buildings Sales Director, and Michael Garceau, Honeywell’s new General Manager shared center stage to deliver Honeywell Building Technologies’ State of the Union Address, taking past problems and operational issues head-on, they then unveiled a host of transformative innovation and technology that nailed the event’s themes of Momentum, Connections, and It’s a New Day at Honeywell. 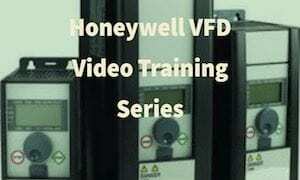 Two great video interviews, with more 2018 Honeywell Momentum video coverage to follow. 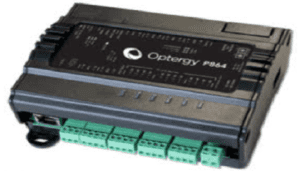 Optergy’s P864 Edge Controller Provides Smart Energy Monitoring and Control. Introducing the P864 Edge controller that operates building equipment autonomously and expands up to 8 IO modules total (144 hardware points). Connectivity is made easy via BACnet IP (PoE), MS/TP, and MS/ TP routing. Applications include HVAC, central plant, lighting and hydraulic systems control and monitoring. 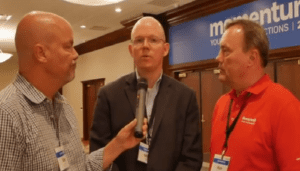 Catching Up with CBRE/ESI’s Paul Oswald at RealComm|IBcon. Thanks to the team at RealComm|IBcon for letting us fill in on Conference Live. 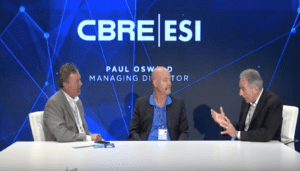 In this video we had the chance to catch up with one of our favorite people CBRE/ESI’s Paul Oswald. We love talking to Paul because of his experience as one of the premier master systems integrators in Smart Building controls. Room Controllers, How Much Do You Know? Take the Schneider Electric Q & A. What exactly is a “Room Controller?” It’s fully configurable and application specific Terminal Unit Controller. 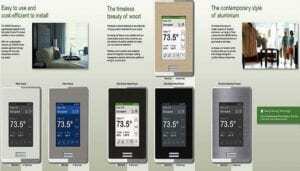 It has built in space temperature with an option for remote temperature sensing. In addition, it can be configured with on board humidity and occupancy (PIR) sensing or those sensors can be external to the controller. 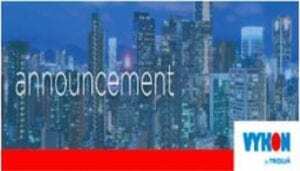 Tridium Update: Release of Niagara 4.3 Ushers in Significant Innovations! Dear valued VYKON Partner, Tridium has released the third version of Niagara 4. Niagara 4.3 introduces enhancements that make it easier to manage and deploy templates, along with several other new features. Most notable about this release are the significant innovations built on Niagara 4.3, including: Backup as a Service (BaaS), our first Niagara Cloud offering launching in mid-July; VYKON Integrated Analytics 2.0u2, with analytic chart enhancements and key defect fixes; Support for JACE® 8000 IO R in both a 16 and 34 point module; and JACE 8000 expansion module Hardware Development Kit (HDK), new for developers. Introduction to Data Modeling, Haystack Tagging and the Benefits. 30 Minutes with Lynxspring Webinar Series. There is no question that data is impacting the building automation, energy management, and smart buildings markets. The data produced by equipment, systems, and smart devices now has more potential value than the devices themselves. However, with all the data now available at our fingertips, it turns out that it’s one thing to have access to data; it’s another to make it useful and actionable. 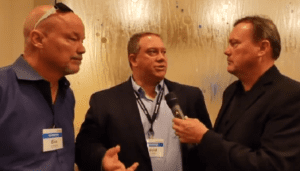 Ken and Eric, the ControlTrends Guys, Interviewed on RealComm Live at 2017 RealComm|IBcon. Ken and I, the ControlTrends Guys, normally the interviewers, had the table turned on us — as we became the interviewees, at the 2017 RealComm|IBcon in San Diego. Jerry asked us some challenging questions that allowed us the opportunity to highlight the ControlTrends Community, review the hot button trends in our industry and how they relate to the RealComm|IBcom Community, as well as talk about some of the great people, solution providers, MSIs, and vendors leading the way in the Building Automation industry. Making HVACR More Interesting Series – Comfort in a Flash: Carrier to Join National Apartment Association’s Maintenance Mania® Competition. ControlTrends is committed to promoting our HVAC industry, which according to a 2015 report from the HVACR Workforce Development Foundation, cited there were 220,734 HVACR job postings in 2014 – twice as many as in the oil and gas industry (109,323), making HVACR one of the fastest growing industries in North America. We have a fascinating and challenging industry and we must do what we can to attract and inspire more of the young workforce to join the HVACR industry. 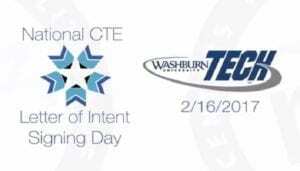 Making HVACR More Interesting Series: National Signing Day Comes to the Skilled Trades from the NEWS. ControlTrends’ second post in our Making HVACR More Interesting Series, is from an insightful article written by Nick Kostora, Staff Writer, at the NEWS, who captures the innovative spirit behind one of the most exciting moments in the career of a student becoming a skilled tradesmen, by using media event momentum typically associated with the sports world, to create an equally awesome event for the future HVAC professional, the National Technical Letter of Intent Signing Day. Making HVACR More Interesting Series: American Boiler Manufacturing Association Awards (ABMA) 2017 Randy Rawson Scholarships. This ControlTrends’s Making HVACR More Interesting Series comes from another great industry organization, the American Boiler Manufacturing Association (ABMA), and annual their Randy Rawson Scholarship Program, which has awarded over $150,000 since its inception. This program is another opportunity to recognize and reward the future stars of our industry. ControlTrends is joined by Ken Sinclair, owner and editor of AutomatedBuildings.com and Therese Sullivan, editor of BuildingContrext.me, as we review some of the highlights of RealComm|IBcon’s Day 1, starting with the CRE Cybersecurity Forum, which brought the best cybersecurity minds in the business together — to address the most impactful cyber threats, share their wealth of industry experience and knowledge, and help attendees set cybersecurity benchmarks and strategies for their organizations. 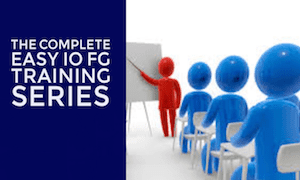 This session was followed by a multitude of pre-conference events that were specifically designed for IT, FM, PM, Energy, Sustainability, Operations and Finance professionals. Jim Young, Howard Berger, Lisa Woods, and the RealComm|IBcon team have achieved yet another industry milestone in orchestrating the most advanced and comprehensive global event for the commercial and corporate real estate industry. 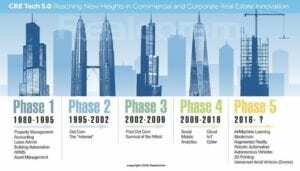 CRE Tech 5.0, has indeed, reached New Heights in Commercial & Corporate Real Estate Innovation! RealComm @ the Intersection of Commercial and Corporate Real Estate, Technology, Automation and Innovation. CRE Tech 5.0 image overview: Over the course of the last 30 years, there have been five major phases of automation that have impacted the commercial and corporate real estate industry. Phase 1 started in the ’80s with applications such as Property Management, Accounting, Lease Admin, Building Automation, IWMS and Asset Management; Phase 2 was based on the technologies of dot.com and the internet; Phase 3 was the aftermath of dot.com and those companies that survived and thrived; Phase 4 began in 2009 after the great recession and included technology platforms such as Social, Mobile, Analytics, Cloud, IoT and Cyber; and Phase 5, which became part of mainstream conversations in 2016 with technologies such as AI, Machine Learning, Blockchain, Augmented Reality, Robotic Automation and Autonomous Vehicles. Structural Health Monitoring (SHM) began in the early 1800’s with railroad wheel-tappers, which used the sound of a hammer striking the train wheel to evaluate if damage was present. The IoT sensor proliferation that continues to increase the number of application instances will soon deliver this significant SHM concept, which is similar, yet different, than our Fault Detection and Diagnostics — nearer and nearer to our workstations (cautious optimism), because SHM will be incorporated into everything: buildings, bridges, every mode of transportation, as well as every large piece of HVAC equipment around us — that we will hopefully continue to integrate with in some manner. FAST COMPANY has the Connected Home Sweet Home covered, but it was this article by Craig Tyler, published in July 2013, in The Los Alamos Science and Technology Magazine, that really spells out the pervasiveness of this technology. Chuck Farrar and David Mascarenas, among other luminaries at the Engineering Institute at Los Alamos, a research and education collaboration between Los Alamos National Laboratory and the University of California, San Diego, are all about solving really sophisticated data-to-decision problems. Fundamental Axioms of SHM IVa: Sensors cannot measure damage. Feature extraction through signal processing and statistical classiﬁcation is necessary to convert sensor data into damage information (http://en.wikipedia.org/). Los Alamos Engineering Institute researchers working in the field of structural health monitoring (SHM) are developing sensor systems to track health and damage information for the nation’s major infrastructure objects—including buildings and bridges, power plants and industrial plants, ships and aircraft, and other large-investment equipment for transportation, entertainment, and scientific research. They are designing and building SHM hardware as well as developing algorithms to screen raw SHM sensor data reliably for evidence of structural degradation. Click here to get your science and technology fix from Los Alamos! Day 3: On the Road continues in San Diego first with a chat with Realcomm’s Jim Young, and next at the Controls Group North America (CGNA) semi-annual meeting at the Hotel del Coronado. We spoke with Jim Young as he travels to the 2014 Niagara Summit with the tremendous Realcomm/IBCON presence. 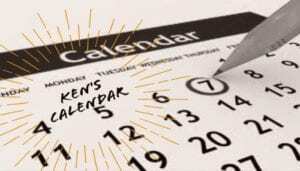 Keep an eye on the next big event on the calendar: June 17-19, 2014! 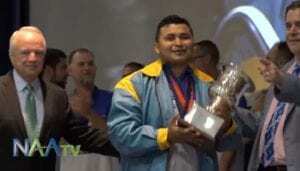 Day 3 san Diego from Eric Stromquist on Vimeo. CGNA’s theme is “Dynamic Alignment – All In.” CGNA will explore how manufacturers, distributors, and contractors align their business practices by focusing on the preferences of end users. Strategic consultants often focus on “aligning” a company’s business plans, communications and components to improve efficiency, effectiveness and financial results. Aligning many independent companies is often more challenging – where natural cross-purposes make it difficult to achieve the benefits associated with true synergy.